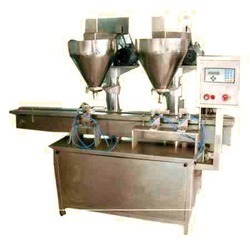 We are a leading Manufacturer of automatic powder filling machine, semi powder filling machine, double head auger filling machine, powder packing machine, automatic milk powder filling machine and detergent powder filling machine from Ahmedabad, India. 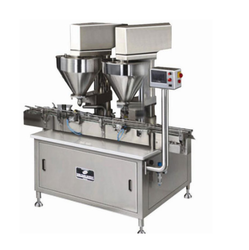 Automatic Powder Filling Machine Specification Output 10 TO 20 Bottles / Bags / Min. ( Depending upon the filling qty., bottle neck dia,and powder Bulk density ) Fill Capacity 10 Gms. to 1000 Gms or as per your requirement. ( With change parts ) Power Characteristics 3 Phase Input Specifications Container Dia As per Your Specifications Container Height As per Your Specifications Accuracy + OR - ( 1% ) We manufacture and export fine quality Automatic Single Head Auger Filling Machine which is developed from superior material using high-tech equipments. 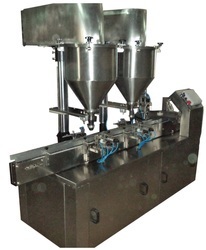 Our Automatic Single Head Auger Filling Machines are known for high performance and low maintenance. 10 Gm. to 250 Gm. o 25 Mm to 70 Mm. o 55 Mm to 110 Mm. 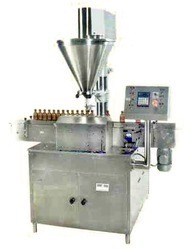 We manufacture and export fine quality Automatic Single Head Auger Filling Machine which is developed from superior material using high-tech equipments. Our Automatic Single Head Auger Filling Machines are known for high performance and low maintenance. · Pneumatic Application for Accurate and Speedy Operation. · Imported Sensors are Used. · opper Capacity : 40 Litr. 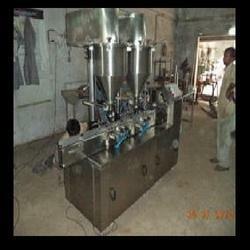 As one of the leading entity of this domain, we are engrossed in providing supreme quality Powder Packing Machine. The key features of the machine are that it can maintain coordination between speed and accuracy. 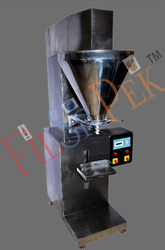 Filling speed of material is 5 to 6 bags per minute, where a bag has the capacity of 25 / 50 / 75 Kg. This machine is controlled by microcontroller, which makes it power efficient and performs better during operation. Besides, clients can get the machine from us at industry leading rates. 3 phase with A.c. frequency drive. 25 Mm to 70 Mm. Power Characteristics 3 phase with A.c. frequency drive. Container Dia 25 Mm to 70 Mm. Container Height 55 Mm to 110 Mm.